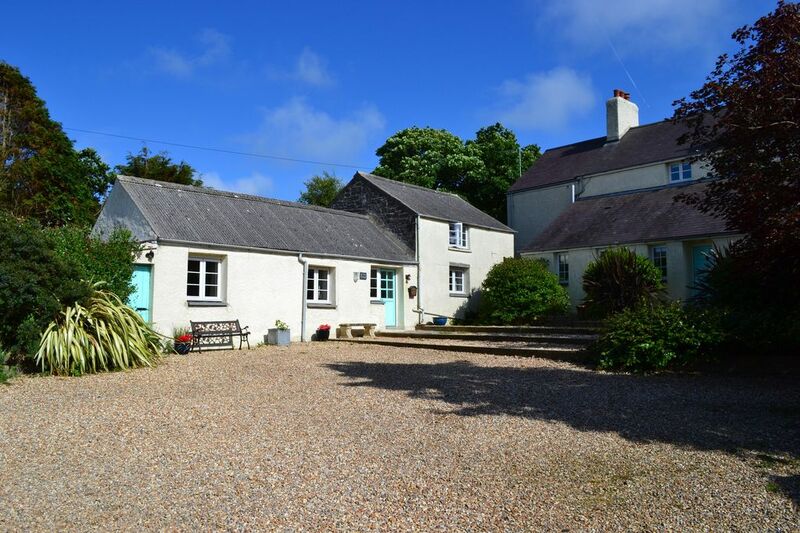 Fir Tree Cottage is a two bedroom detached property set within the Pembrokeshire National Park. It sleeps four people and is located in a peaceful rural setting just five minutes drive to the picturesque beach of Barafundle Bay. We are within easy drive of Freshwater West, Broadhaven South and Freshwater East. As well as Tenby, Saundersfoot and Manobier with its picturesque castle and village. Oakwood Theme Park and Folly Farm are just two ideas for great days out with the family and Pembroke Castle, birth place of Henry VII is just a five minute or so drive from the cottage. We are fortunate to have many castles and places of historic interest so close by to us here. The cottage is spacious, clean and very well equipped. On the ground floor there is a living/dining room, kitchen, double bedroom and shower room. Upstairs there is a twin bedroom and bathroom. The living/dining room has a cosy sitting area with freesat tv and dvd player and a large selection of dvd’s and books. The kitchen is equipped with cooker, fridge/freezer, microwave, dishwasher and washing machine. Outside there is a private courtyard garden for relaxing with a glass of wine after a busy day. We have provided a barbecue for any guests who fancy a bit of outdoor cooking. We live in the adjacent property with no other neighbours. The cottage has its own parking space and rear garden. We are on hand for any assistance but otherwise your privacy is assured. For families with young children there is a high chair, toilet adapter seat, booster step and a baby bath. There are a couple of boogie boards to borrow if you fancy body boarding. If you are a cyclist, we have a garage in which to store your bikes and we can provide packed lunches on request so you can go out for the whole day and explore. We know how important your holiday is to you. We know what it is to arrive at a rented cottage for a holiday and either be wonderfully suprised or terribly disappointed. We really want you to enjoy your stay and go home with happy memories of this magical part of the world. My husband and I moved back home to Pembrokeshire in 2014 after many years of living in Edinburgh. Although we both love Scotland, I am half Scottish, we have always wanted to return. There is simply no other place we would rather be. The quality of light, the clarity and ever changing colour of the sea, the very greenness of it all. We love living here and look forward to welcoming you. Pembrokeshire is one of the most beautiful places on earth. Rugged coastline, historic castles, awarding winning beaches and wide open skies with such a quality of light that you will not want to leave. The pace of life is slower here, people you meet will chat and advise you on the best places to visit and what the weather will be like tomorrow…Pembrokeshire seems to have its own climate here regardless of what the rest of the country is experiencing. “you and me and the sound of the sea”…well not quite but Fir Tree Cottage is only five minutes by car to our nearest and most beautiful beach, Barrafundle Bay. The Cottage is also five minute drive from the market town of Pembroke, birth place of Henry VII with its magnificent castle. Once you turn off the road and drive up the leafy lane lined with wild flowers, you know your holiday has begun. Fir Tree Cottage is such a pretty place, it is bright and welcoming and home to foxes, badgers, rabbits and squirrels. Red Kites and Swallows by day and owls and bats by night. You will be woken each morning by a chorus of bird song and the sound of the wind in the trees. Fir Tree Cottage is a detached property set within the Pembrokeshire National Park. It is located in a peaceful rural setting just five minutes drive to the picturesque beach of Barafundle Bay. The beautiful beaches of Fresh Water East, Broadhaven and Fresh Water West are all within ten minutes drive. The Pembrokeshire Coastal Path offers breathtaking walks with the opportunity to see seals, porpoises and dolphins. We only provide hand towels. Please bring your own bath and beach towels. The beds will be made up for your arrival, with a choice of feather or micro fibre pillows. Detergent and a washing line/clothes pegs provided. Hand, bath and tea towels provided..a few less things to carry. The living room is bright and sunny and has a TV, dvd player and free sat. There is a really good selection of dvds and books. Salt, pepper, vinegar and tea, coffee and sugar are all provided. The kitchen is bright and welcoming and has everything you need for home away from home. There is an ample dining area in the living room with two further chairs in the cottage. Lots of books for every reader. Good choice of films including plenty for children. Private courtyard garden with candle lanterns. Clothes line. Garden table and benches. Sunny seating area to the front of the cottage also. Two boogie boards on request...no charge. I am sorry, the drive has pebbles and steps so is not suitable for wheelchairs. The cottage is quiet, pretty and very comfortable. Although it feels miles from anywhere you are only 5 to 10 mins drive to the nearest beach which is the award winning Barafundle Bay and 6 mins to Pembroke with its impressive castle and local shops. We have lots of wild birds who live in our garden and nightly visits from badgers, foxes, rabbits ...and moles! We are really happy to help in any way we can to make your holiday a memorable one. There is so much to do here it would take too long to list.. Surf lessons, horse riding, cliff climbing, walking, cycling, kayaking courses for all ages etc. Super cottage, ideally located to visit so many fabulous places, the cottage is very well equipped with a lovely ‘welcome pack’, & plenty of towels, thank you Tanya! Thank you for your lovely review, really good of you to take the time. So pleased you enjoyed your break away. Beat wishes. Fir Tree cottage had everything you could want. Well equipped and comfortable. Tanya our owner was also really helpful. Would come again good value. Lovely, well equipped cottage, super comfy beds! Super place to stay for exploring the area, lots of lovely sandy beaches and hidden coves, castles and historical sites. Manorbier castle and village was a gem. Had an excellent week in the cottage, The property is superbly furnished with all mod cons, the most comfortable beds and fantastic location. We had a great week in Pembrokeshire staying here. So many wonderful beaches nearby. The cottage itself is pretty and comfortable, and the location is peaceful. We also enjoyed meeting Tanya, who was a really friendly and pleasant hostess. She also knows the area inside out, and was very helpful.